Sundance Mountain Resort is a ski resort located 13 miles (21 km) northeast of Provo, Utah. It spans over 5,000 acres (2,000 ha) on the slopes of Mount Timpanogos in Utah's Wasatch Range. Alpine skiing began on the site in 1944. Actor Robert Redford acquired the area in 1968, and established a year-round resort which would later spawn the independent Sundance Film Festival and the non-profit Sundance Institute. Sundance is committed to the balance of art, nature and community. 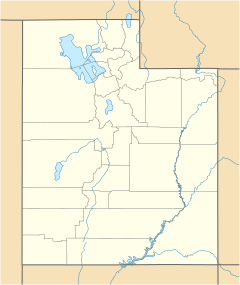 In 1922, the Forest Service over the Wasatch National Forest, part of the United States Department of Agriculture, requested to put in a trail that crossed part of the property owned by the North Folk Investment Co, The Stewart family appreciated the hikes since they brought more popularity to the area. :26 Today, the trails around the Sundance Mountain Resort offer views of North Fork, Utah and of Stewart Falls. Many trails also feature plaques to mark flora and fauna in the area and are lined with benches. There are also 3 major biking trails at Sundance that even have ski-lift service after Memorial Day weekend. The resort had a rope tow that was built by J.W. Daniel, who had tried to make a tow in Hobble Creek Canyon near Springville, Utah. The tow was powered by a Chevrolet truck, but was unsuccessful in that area. The Timpanogos Mountain Club persuaded Daniel to bring the tow to North Fork Canton. The tow was not ready for winter of 1944, and so it was abandoned by the club. Ray Stewart bought the truck and equipment and overhauled it to create a working tow to run on Saturdays and Sundays. The tow was difficult to use, however, because some of the roads leading to the resort were not plowed regularly making it difficult to drive the truck, and cold mornings caused the vehicle to freeze over. The tow pulled skiers 500 feet up the mountain. In addition, When Timp Haven opened, the creek was closer to the hill than it is today, so skiers had to make a quick turn at the bottom to avoid falling into the water. Ski season at Timp Haven started around Christmas and lasted util early March. A day pass to ski was only $1, and due to lighting installed by Provo City, Timp Haven allowed night skiing on Mondays, Wednesdays, and Fridays. While owned by the Stewart family, the ski area was closed on Sundays. Timp Haven also held ski races that were sponsored by various local organizations like the Timpanogos Ski Club or the Hoover Cup. The Timponogos Mountain Club cleared an area on the east hill and built a 45-foot ski jump. Ski classes at the resort were started by Jessie Scofield, the supervisor of Provo City Recreation, in the winter of 1946. Professors at Brigham Young University also started ski classes, bringing buses of students in the afternoons. By that time, Timp Haven also had a tubing and toboggan hill. The Stewart family began expansion in 1947, and a T-bar lift was added at the base in 1948 (the same year as the ski jump was rebuilt) which was about 1,000 feet (300 m) in length, The lower terminal was seated on a platform that was 14 feet in the air. A 1938 Ford truck provided the power for the lift. This lift ran until 1953 when a single chairlift was added in the fall. It had a length of about 2,500 feet (760 m). The first double chairlift was installed in the fall of 1965 and replaced the lower single chair and an upper T-bar, vertically climbing 1,400 feet (430 m). It had an accident the following July which resulted in two fatalities. The resort continued expanding, however, and a lodge was built in 1957 (whose foundation is under the General Store and Grill Room today). A poma lift was added in 1958. A modern ski lift, the Mandan, was installed in 1964 and the two T-bar lifts were removed. The Navajo lift was installed in 1969, and the Arrowhead lift in 1985. The Stewart family built a subdivision on "Stewart Flats" in the 1960s called Timp Haven Homes. Robert Redford purchased a 2-acre lot. :48 Later, in August 1968, Redford purchased the entirety of Timp Haven, the land that is now known as Sundance,:11 The resort was renamed from Timp Haven to Sundance, after the role Redford played in the 1969 film Butch Cassidy and the Sundance Kid. The resort of Sundance is not to be confused with the town of Sundance, Wyoming, the location from which the Sundance Kid received his name. Redford's 1972 film Jeremiah Johnson was filmed near the resort. In November 1979, Redford held a 3-day conference for filmmakers and professional artists at the Sundance Mountain Resort. The goal of the event was to promote indie filmmakers. These efforts laid the foundation for what would become the Sundance Institute. :8–13 In 1981, the Sundance Institute was founded to foster and celebrate the diversity of American filmmaking. 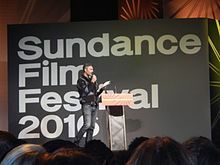 Today, the Sundance Film Festival is held each year in January and primarily 30 miles (50 km) north in Park City, and is a popular and well-known competition for independent film makers. It is the largest independent film festival in the United States, and also one of the largest in the world. It features documentaries, large films and small films. The festival receives over 9,000 submissions, and around 200 are featured. More than 50,000 people attend the festival each year. The small town that surrounds the resort is home to 28 full-time residents, with many residents living in the area more than 50 years. Several notable people have owned residencies in the Sundance Resort properties, including Sidney Pollock, William Devane, and Daniel Melnick. Today, Sundance Mountain Resort has skiing for every ability, with 20% beginner trails, 40% intermediate trails and 40% advanced trails. 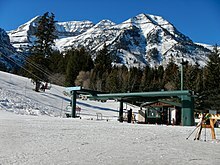 The resort terrain climbs 2,150 vertical feet (655 m) up the northeast slope of Mount Timpanogos, reaching the crest of the ridge at Bearclaw Cabin. This restaurant at the resort's apex of 8,250 feet (2,515 m) provides spectacular 360° views of the surrounding landscape, and of Mount Timpanogos as it rises to a height just short of 12,000 ft (3,660 m). In 1994, a new quad lift was added to Sundance that was named "Ray's Lift" to honor Ray Stewart and all of the work he put into developing Timp Haven. the lift offers direct access to the back of the mountain and covers over 5,400 feet with a vertical rise of 1,400 feet. This lift has a capacity of 1,800 skiers uphill and 900 downhill. The mountain is serviced by four chairlifts and a handle tow for beginners at the mountain's base. Sundance now offers the 6th longest zip line in the United States which features the most vertical drop of any zip line on the North American Continent. In 2015, Sundance Mountain Resort decided it would retire its triple chair Arrowhead lift and replace it with a quad chair lift. The new quad chair lift is named "Reds Lift" in honor of Robert Redford and his family. The new quad lift has been fully functional since the 2016-2017 ski season. Reds Lift carries 500 more people uphill per hour than the triple it replaced; therefore reducing the waiting time in line and enabling more time on the mountain. ^ Pearson, Howard (August 3, 1968). "Star, wife set up Utah businesses". Deseret News. p. 2B. ^ a b "Slope manicure for Timp Haven". Deseret News. August 31, 1968. p. B1. ^ "Sundance Village and Ski Resort". Utah.com. Retrieved 2009-02-08. ^ AuthorSeries. "Sundance Mountain Resort Founded by Robert Redford | Sundance, Utah". 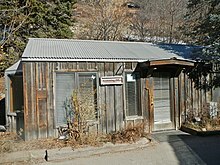 Sundanceresort.com. Retrieved 2016-01-22. ^ Wilmshurt, Cindy (Winter 1990–1991). "Sundance-in the beginning it was the Stewart homestead". Sundancer. ^ a b c d e f Stewart, Justin (1987). A history of Sundance, Utah. ^ Carter, Edward L. (14 Jul 1997). "Timp path began hike to popularity 85 years ago". Deseret News. ^ a b c Christensen, La Verl (26 Dec 1984). "The Alps of Utah". The Herald Magazine. ^ "Sundance Resort Biking Trails". Utah Mountain Biking. Retrieved 23 August 2016. ^ a b c d "Timp Haven boasts new 'T' tow". Deseret News. December 7, 1949. p. A13. ^ a b c d Anderson, Barbara Stewart (2005). Before Sundance: Ray Stewart and Timp Haven. Raymond R. Stewart. ISBN 1-58308-398-7. ^ Kadleck, Dave (January 23, 1965). "Busy place, fine resort". Deseret News. p. A5. ^ "Provo to Have New Ski Center". The Deseret News. ^ Zimmerman, Josephine (10 Mar 1996). "'Ray's Lift' was the first ski lift in Provo Canyon". Mountainland Centennial. The Daily Herald. ^ "New equipment put in at Provo's Timp Haven". Deseret News. November 18, 1953. p. 8B. ^ Perry, Leo (January 15, 1960). "Timp Haven resort proves popularity". Deseret News. p. 8B. ^ Perry, Leo (January 8, 1966). "Timp Haven adds chair lift". Deseret News. p. A5. ^ Perry, Leo (July 15, 1966). "2 killed in ski lift plunge". Deseret News. p. 1B. ^ Sive, Walter (1991). "History of skiing at Sundace began in the 1940s". The Sundancer. ^ a b Rea, Dorothy O. (September 15, 1969). "Sundance readies year-round fun". Deseret News. p. 10B. ^ a b c d Biskind, Peter (January 2005). Down and Dirty Pictures. Simon & Schuster. ISBN 9780684862583. ^ "'Hot' show in a 'cool' setting". Deseret News. August 11, 1973. p. 6D. ^ "Our Story". About Us. Sundance Institute. Retrieved 23 August 2016. ^ a b Anderson, John (January 2000). Sundancing: Hanging Out And Listening In At America's Most Important Film Festival. Harper Paperbacks. ISBN 9780380804801. ^ Cantrell, John (Nov 2002). "The Seasons of Sundance". Town & Country. Retrieved 23 August 2016. ^ "Sundance Film Festival". Indiewire.com. 2013-01-27. Archived from the original on 5 Apr 2016. Retrieved 2016-01-22. ^ "Sundance Ski Resort". Ski Properties. Sotheby's International Realty. 19 Nov 2012. Retrieved 23 August 2016. ^ "New Quad Lift Extends Prime Skiing". The Sundance Community Newspaper. 1995. ^ "ZipTour Quick Facts". Sundance Mountain Resort. Retrieved 23 August 2016. "Major Improvement Announced at Sundance Mountain Resort.". SKIUTAH. Retrieved 8 December 2016. Wikimedia Commons has media related to Sundance Resort. Barbara Stewart Anderson collection on Raymond R. and Ava Beckstrand Stewart, MSS 8176, at L. Tom Perry Special Collections, Brigham Young University. Includes information on the development of the Timp Haven lodge.